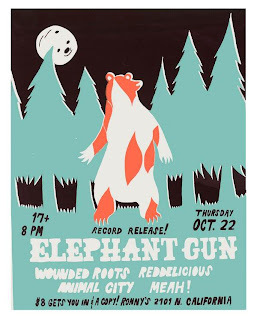 Chicago ballroom folk-rockers Elephant Gun are releasing their latest effort in the recording studio tomorrow night, Thursday, October 22nd, at Ronny's in Logan Square. Beartime Stories, the follow-up to 2007's KP (Cassete Deck), shows the band expanding their sound with a richer instrumental texture and more sophisticated songwriting. The album is currently streaming in full on Elephant Gun's myspace page, and is well worth a listen. The 17+ show starts at 8 pm, and costs $8, which includes a copy of the new album. Meah!, Wounded Roots, Animal City, and Reddelicious support.